The expedition team at Pasighat. Image credit: Prafulla Kaman. The team of scientist accompanied by guide and trained photographer from Derhadun based Wildlife Institute of India (WII), which has been conducting wildlife expedition in Siang river basin in Arunachal Pradesh, reached at Tuting and Geling of Upper Siang district bordering China. The expedition team has been conducting scientific study on the biodiversity existing in the natural flora and fauna along Siang river basin. Thus, their activities include comprehensive survey & documentation on wild species, camera trapping, sound trekking of the wild animals and scientific photography, which is to be published in the form of books and research papers. 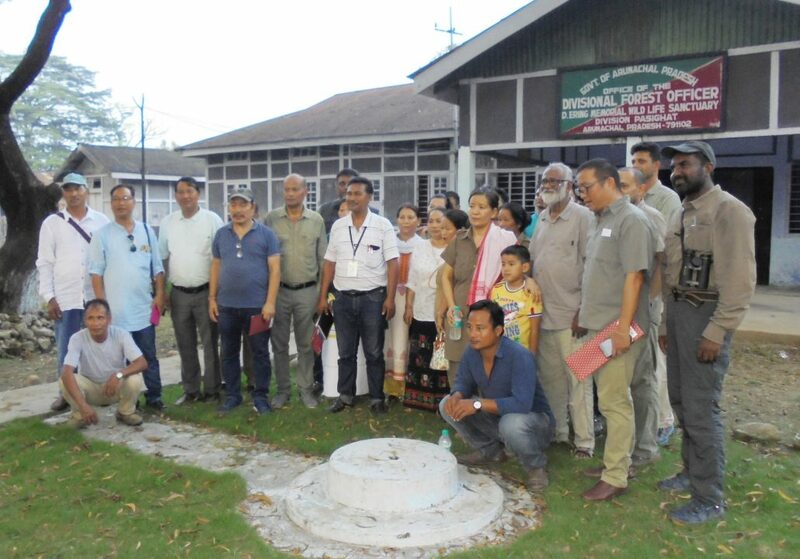 The team, which arrived at Pasighat in East Siang district and started work on September 30, conducted survey in Poba and Lali Reserve Forests besides Daying Ering wildlife Sanctuary bordering Assam early this month. The team was forwarding towards Upper Siang hill forests along right bank of Siang river and reached Indo-China border on the second week of this month. They subsequently entered Mouling National Park in Upper Siang district to conduct study on wild lives thriving in the area. The team of wildlife experts accompanied by Divisional Forest Officer (wildlife) of Mouling NP Boken Pao conducted an awareness meeting at Yiibuk village adjacent to the park and explained the local villagers about the importance of wild animals and birds in terms of ecological balance. Addressing the local villagers, DFO Pao urged the local villagers to conserve the natural flora and fauna, said that existence of the wild beasts in their area would sustain their livelihood through eco- tourism development. He also appealed them to help the scientists and researcher come from abroad and learn about wildlife management from the experts. The team is presently conducting survey and camera trapping inside Mouling National Park. They are also using Drone Camera to trace wildlife existence on the high altitude region (hill peaks) in the national park. The expedition team has documented several species of birds, reptiles, insects and found some new species, which is not yet disclosed in details. The expedition team led by Dr Abhijeet Das (Zoologist) comprises Dr Monuj Naik (Ornithologist), Dr Bivash Pandav (Tiger expert), Dr Navendu Page (Plant taxonomist), Bivek Sarkar (Entomolgist), Dhritiman Mukherjee (trained wildlife- photographer), retired Professor (wildlife) Sushil Kumar Dutta and others. Their activities include comprehensive survey on wildlife and documentation, sound trekking of the wild animals and scientific photography, which will come up with book and scientific arctic. The ecological expedition also aims at survey on historical route of wildlife survey along Siang river basin made by the Britishers during ‘Abor Expedition’ in early nineteenth century. The British went on expedition in the Abor jungles, which is presently known as Siang region of Arunachal Pradesh divided into five districts – Siang, East Siang, West Siang, Lower Siang and Upper Siang. The team will come back to Pasighat on October 22 and culminate their expedition at Pasighat on October 25 next.